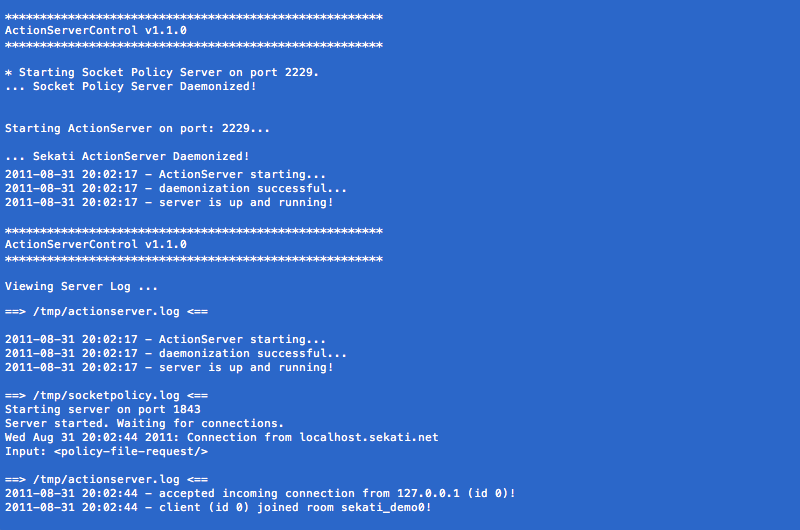 Sekati ActionServer is a light-weight, C based, TCP/IP Echo Socket Server. It functions as the networking glue for any real-time multi-user or hybrid technology application. The daemonized server opens TCP port 2229 for incoming connections, awaits a channel join command (this allows for a single server instance to host many different applications without message overflow), then broadcasts any messages received from clients to all other connected clients in real-time. To allow users to view each others cursors & clicks in realtime by acting as an XMLSocket server. To communicate between X-Bee Wireless Arduino’s & a receiving Web Application. To communicate between an SMS Text Message Gateway & an interactive projections.